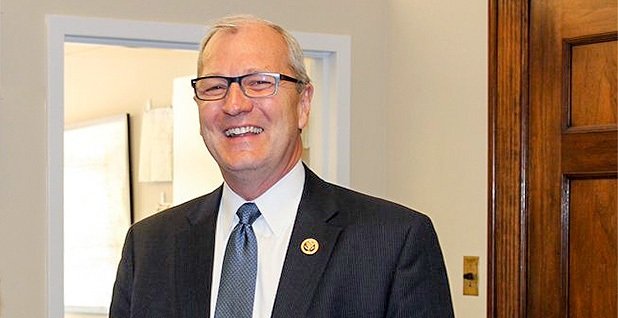 Rep. Kevin Cramer (R-N.D). Photo courtesy of @RepKevinCramer via Twitter. North Dakota Republican Rep. Kevin Cramer didn't get picked to be the next Energy secretary, but he's in a prime position to help shape energy policy during the Trump administration. Cramer, 55, was an energy adviser to Donald Trump during the campaign. He sits on the powerful House Energy and Commerce Committee, and could ascend to the Senate in two years. The lawmaker isn't ruling out a bid to unseat Sen. Heidi Heitkamp (D-N.D.), he said in a recent interview. Heitkamp, who's up for re-election in 2018, is seen as a top target for Republicans. Cramer chatted with E&E News this week about being interviewed for Trump's Cabinet, his first job mopping floors at a cafe and the big-city allure of Fargo, N.D.
What are you most looking forward to under the Trump administration? The pace of things, I expect, is going to change. Probably the thing I'm most looking forward to is passing bills that become law as opposed to vetoed. Are you expecting to be involved with the administration? I was interviewed for secretary of Energy. ... What I told the president-elect and the chief of staff, and I told the vice president-elect, I just want to help in the best way I can move forward a Donald Trump energy agenda that I'm pretty much in agreement with, either in the House of Representatives or as a member of the Cabinet. What are the chances you'll run for the Senate in 2018? I'm in one of those positions right where I'm an at-large member and enjoy the status of an entire state, not just a congressional district. With that comes the luxury of not having to make that decision early. You're not ruling it out? Never rule it out, for sure. You've advocated combining DOE and EPA. What are the chances of that happening? I would say there's a pretty low chance of it. You grew up in Kindred, N.D. What's the most exciting thing about Kindred? Kindred is a little farming community in the Red River Valley close to Fargo. When I was growing up, the most exciting thing was to go to Fargo, and we did that pretty regularly. ... Kindred was a town of about 500, it's probably 100 or more than that now. When I was 12 years old, I remember getting this job at the local cafe, cleaning it every evening. So I mopped the floors and cleaned the tables and got it ready for the next day. It was called Thompson's Cafe. Oh, gosh. I haven't drank beer for 10 years, but I love it, so it's probably a non-alcoholic beer. I gave it up for two reasons: One, we have a son who has a drinking problem. ... Also, we adopted a little boy, he's now 9. ... He grew up in a very dysfunctional situation in his life, and his mother was actually killed by his stepfather, and Abel was a witness to that just before his 3rd birthday. And, of course, drugs and alcohol were all a part of that, so we just really feel strongly that we're just better off not doing that stuff. My favorite TV show is "King of Queens." ... He's a blue-collar guy, and that's my world. I grew up in this blue-collar world with regular people. He puts really a lot of funny into being regular. Third Day, a contemporary Christian band. I don't mean to sound sexist, but I'm like every man that you'd probably ask that question of. I'm really good with the grill, which means, by the way, I'm no good with anything else. I drive a Yukon with 209,000 miles on it. A black Yukon XL. When you represent an entire state the size of North Dakota — it's not Montana, it's not Wyoming, but it's big, it's big enough — you put a lot of miles on your personal vehicle. You have five kids. What's your secret for staying sane? I have this motto. I have various mottos, but one of my favorites is, "I refuse to panic."